Detroit — Wayne County has reached a tentative agreement with Dan Gilbert’s Rock Ventures to build a proposed $533 million criminal justice center. The justice center is to be built on a property at the Interstate 75 Service Drive and East Warren. It will house a 2,280-bed jail, sheriff and prosecutor staff and administrative offices, criminal courthouse and juvenile detention facility. It’s expected to be completed by summer 2022. County officials note key components of the deal must still be signed off by the county’s commission and building authority. The announcement of the deal was made Wednesday at a press conference held by County Executive Warren Evans. Under the agreement, the county will spend $380 million on the project with Rock Ventures covering the rest of expenses, including any overruns. Rock is estimated to pick up $153 million of the project. If the cost of the project is lower, Rock and the county will share in the savings. “This agreement is an outstanding example of Detroit 2.0, where the public and private sectors partner together in a smart, cooperative and optimistic manner to find and implement the best outcome possible,” Gilbert said in a statement. Late last year, Detroit’s City Council approved a land swap deal with Wayne County on the city-owned land near I-75 and Warren so that the county could allow Rock Ventures to build on the site. In return, Detroit is to get the shuttered American Motor Corp. headquarters on Detroit’s west side. That swap was a key piece to the proposal by Gilbert, chairman of Quicken Loans, to build the jail on Detroit Department of Transportation property on East Warren under the condition that Wayne County acquires the land from the city. The final agreement on the land swap deal with Detroit still requires the approval of the Wayne County Commission and the Wayne County Land Bank, county officials noted Wednesday. In exchange for the complex, Rock Ventures wants to use the unfinished jail site on Gratiot in Greektown for a mixed-use development that has yet to be determined. In April 2016, Gilbert and Detroit Pistons owner Tom Gores announced their desire to build a 25,000-seat Major League Soccer stadium on the jail site as well as retail and residential units, a hotel, covered parking and plazas. The planned for the soccer stadium was later scrapped in favor of using Ford Field to host MLS games should Detroit be selected for a franchise. Wayne County started construction of a $220 million jail on the Greektown property in 2011 under then-County Executive Bob Ficano. The 2,000-bed project near the Frank Murphy Hall of Justice was later halted in June 2013 amid $100 million in overruns and charges of corruption. About $151 million was spent in construction, acquisition and design of the jail, with much of the work done underground, according to officials. Since then, the half-finished jail has sat unused at the cost of $1.3 million a month, county officials estimate. 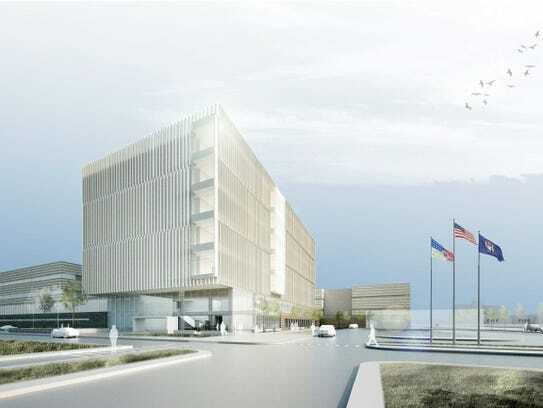 The agreement with the county also allows Rock Ventures to collect $30 million in parking revenues from parking sites around the new criminal justice center — further profits would then go to the county. 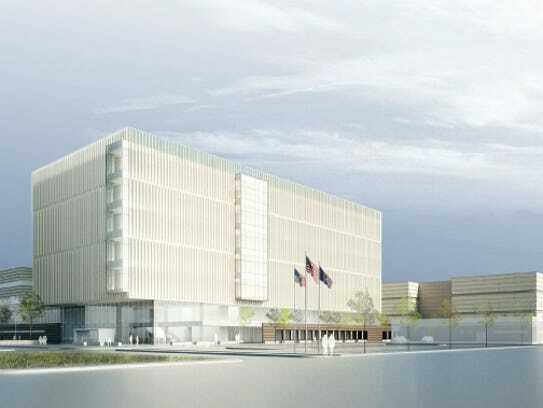 “I’m also pleased that building the new jail will allow us to close the county’s three existing jails, leading to improved efficiency, cost-savings and addressing the long-standing poor conditions,” Evans said.